I've decided this year that I'm going to throw out all the fan voting, players and coaches voting, managerial picks, injury replacements, pitchers who can't pitch because they started on the Sunday before the game, final vote picks, blah, blah, blah, and just pick 32-man rosters (20 position players [minimum of 2 players at each fielding position], 7 SP, and 5 RP) for each league for the All-Star Game and be done with it because I disagree with all the layers of crap that have built up with this exhibition game over the years. I'm also throwing out the one representative from each team rule (don't worry - despite the dreadful first half, the Blue Jays do have a representative thanks to the dearth of quality players at his position in the AL) because I don't believe in participation medals at the professional sports level of competition. You want representation, get some good players. I'll mention who I would've taken from the teams that aren't represented (two of them), and who I would've had to remove to get them on there, but I'm not putting them on if I think they don't merit it. Ok, let's go already. First off, the two players that I would've included from the teams that were left out. The teams were Kansas City and the White Sox. I would've brought in 2B/OF Whit Merrifield from the Royals and bumped OF Mitch Haniger of the Mariners. I would've bumped OF Nicholas Castellanos, but then the Tigers wouldn't have a representative, so Haniger it is if I were going to follow the participation medal rule. For the White Sox, I would've placed SP Reynaldo Lopez on the roster and bumped SP Blake Snell of the Rays. The C and 1B selections are not an indication that I'm losing my mind. They are more a reflection of the talent pool at these positions in the American League being absolute dog vomit at the moment. Cron has split time with Brad Miller and Jake Bauers at 1B and been more of a DH in Tampa this year, but he has played some 1B and the situation was kind of...um...dire. If you need someone who's spent most of his time at 1B, then Yulieski Gurriel of the Astros is your man. As for catcher, yes I did select a guy with a .209 batting average as the backup. That should tell you all you need to know about the rest of the field *Barfs*. Max Stassi of the Astros could also have been the backup there. Ugh. Now to the obvious controversy: 2B. On an everyday basis and a context neutral basis, the better player is Jose Altuve of course. Both players have been doing serious damage at 2B this year. I was just really impressed by when Jed Lowrie was doing his damage (as per WPA and REW). Over a full season theoretically this should even out, but right now Lowrie is far outpacing Altuve in these two context dependent categories, so Lowrie it is. Some will say WPA and REW are neither predictive nor skill-based and that's a fair point. But I'm looking at what has happened up to now, not what will happen the rest of the season. One pair of selections the FIPsters are going to grill me on are Snell and Trivino. That's fair. 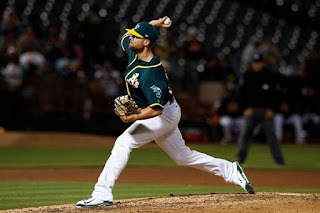 I prefer bWAR for pitchers because to me fWAR assumes that all defenses are the same, and that is far from the case. bWAR includes in its calculation an assessment of the defense that played behind the pitcher in question. fWAR looks at average outcomes on balls in play across the league, as well as the three true outcomes (four with the inclusion of HBP to go with BB, K, and HR), which does nothing to account for the defense behind the pitcher, and doesn't seem to be as thorough as bWAR to me. I still use fWAR, but I would say it's outweighed by bWAR for me. There's also SIERA (Skill-Interactive ERA), and to me it's better than FIP as it includes groundball/flyball tendencies in it's calculation, but I still don't see where it's accounting for the skill of the defense that played behind the pitcher and cutting him some slack if they were downright abysmal (see deGrom, Jacob and the bumbling New York Metropolitans - but that is for another day). Feel free to disagree with me in the comments below. I'll probably learn something or at least consider something I hadn't considered before. Treinen's had a hell of a season so far for the Athletics. The bubble gum card stats are crazy good (5-2, 24 SV, 0.94 ERA), but they don't tell the whole story. He also has put up 2.1 fWAR and 2.3 bWAR to go with a league leading 3.80 WPA. 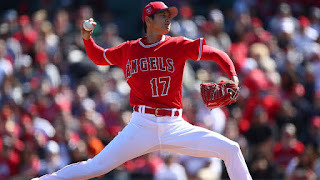 He has an extremely low HR rate (3.2% HR/FB, which could be luck or a function of the pitcher's paradise that he calls home or both), and a high strand rate (83.3%), which means he could be due for a regression in the second half. 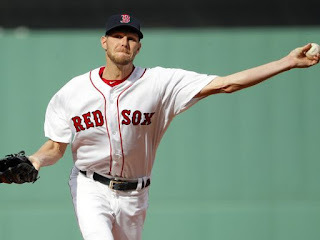 If he does regress, Chapman, Diaz, and/or Kimbrel could easily catch him as they are all breathing down his neck (some might say they've already passed him along with other relievers, but not me). Those four are extremely closely bunched IMHO. Jose Leclerc (TEX), Matt Barnes (BOS), and David Robertson (NYY) could also join the fray if Treinen slips at all. One guy who most likely won't is my All-Star guy Lou Trivino (OAK), as he has an impossibly high strand rate of 95.2% and is probably due for a crash, but you never know. 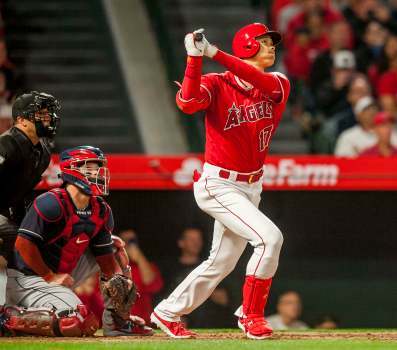 Yes, he has missed a truckload of time and his season might be in jeopardy due to his elbow issue, but what Shohei Ohtani has done so far in 54 games has made me a believer that at this point he is the 2018 AL rookie of the 1st half. Remember that rookies get varying amounts of playing time due to when they get called up, and in the case of two of these three (Ohtani and Torres), possible injuries. When he has been on the field, he has been flat out ridiculous. He's doing things that nobody that's still alive today has ever seen. Well ok, maybe people are still around that saw Wes Ferrell but even they are getting up there. Ferrell pales in comparison to what this guy is doing (and that I as a baseball fan hope he continues to do). Consider this: Ferrell finished his career with a 116 ERA+, and a 100 OPS+ (100 wRC+), and his career ended 77 years ago. So far in his career, Ohtani has put up (in, granted a limited sample size) a 132 ERA+, and a 144 OPS+ (145 wRC+). He is providing above average value at both pitching and hitting, which is unheard of in the history of...well a long time now. The severity of his injury will determine where he winds up by the end of the season, but hopefully he's back soon so we can all sit back and watch something that is truly historical. You've already heard about Trivino up above (7-1, 4 SV, 1.22 ERA, 3.05 FIP, 3.17 xFIP), and Gleyber Torres is doing amazing things under the bright lights in the Bronx (140 OPS+, 143 wRC+). I would say these three have separated themselves from the rest of the field so far. Other rookies who are doing well: Ryne Stanek (TBR), Brad Keller (KCR), Jake Bauers (TBR), Hector Velazquez (BOS), Shane Bieber (CLE), Ronald Guzman (TEX), and (Wolf's new favourite player due to his surname) Niko Goodrum (DET). Based on experience from previous seasons these seven may get into the race or somebody who's had relatively little playing time or is in the minor leagues currently may make up for lost time (2016: Gary Sanchez, Aledmys Diaz, Trea Turner; 2017: Rhys Hoskins, Matt Chapman, Matt Olson) with a dominating performance down the stretch that makes them hard to ignore. Once again Chris Sale is my "clubhouse leader" for the Cy Young Award in 2018. The question with him (always) is can he maintain it in the second half, or will he fade as he usually has? In his career, his 1st half stats have looked like this: 69-26, 2 SV, 2.66 ERA, 6.71 H/9, 0.77 HR/9, 1.96 BB/9, 10.68 K/9, 0.96 WHIP, 5.46 K/BB, and his second half stats have been: 32-36, 10 SV, 3.28 ERA, 8.05 H/9, 1.11 HR/9, 2.23 BB/9, 10.91 K/9, 1.14 WHIP, 4.90 K/BB. A whole bunch of pitchers would line up if they were guaranteed to get his second half numbers, but there's no denying they represent a dropoff from his 1st half stats (K/9 excepted). So which Sale will we see in the second half? I seem to recall a delicious Blue Jays' game in the second half of 2017 against him. Ah yes (thank you BB-Ref) there it is. It was his final start of the season: 5 IP, 8 H, 5 R, 5 ER, 2 BB, 8 K, 4 HR, 1 HBP and it kind of left him with a deer in the headlights look on his face. That's not something you see too often with this stud of a pitcher who routinely finishes in the top five in RL Cy Young voting. He may not be well liked in these parts, but make no mistake about it, Trevor Bauer is enjoying a huge breakout season for the Clevelands. Whatever category you want to pick, he's posted a career best in it this year (except winzzz, but ERA, ERA+ [AL leading 198], FIP, WHIP, H/9, HR/9 [MLB leading 0.40], BB/9, K/9, and K/BB). If Sale lets down at all, Bauer could be all over him. His strand rate looks reasonable to me (76.9%), but the HR/FB rate (5.1%) could be due for some regression. Severino and Verlander are right there just below Bauer for me (You'll see in a moment that I flip-flopped Verlander and Severino for MVP). Severino scares the hell out of me because he's only 24 and he's with the MFY. He's already so good (fourth in my end of season AL Cy Young rankings last year behind Kluber, Sale, and Carrasco, and ahead of Verlander) at such a young age. Why baseball gods? Why? Verlander just keeps chugging along at age 35 on his way to Cooperstown. Kluber's a notch below along with Gerrit Cole and Blake Snell. I think these are the front seven in contention for the CYA. Sale's in the lead for now, but watch out for those second half surges (see Kluber in 2017, who was not even in my top five just before the All-Star break and then roared back to take my CYA and the RL one). As Satchel Paige famously said: "Don't look back, something might be gaining on you." Right now it's a photo finish between Betts and Trout for me, with Betts just coming out on top. The incredible Jose Ramirez is not far behind. From there, I see a huge dropoff before we get to Sale and Bregman, who are so close that they are interchangeable. Then a bit of a dropoff to the next six players (Bauer, Martinez, Judge, Lindor, Verlander, and Severino). That sextet is extremely tightly packed together, such that you could probably re-arrange them in any order should you choose to. Then there is a dropoff to the rest of the league. That top trio are all above average baserunners and defenders that are having almost cartoonish offensive seasons. 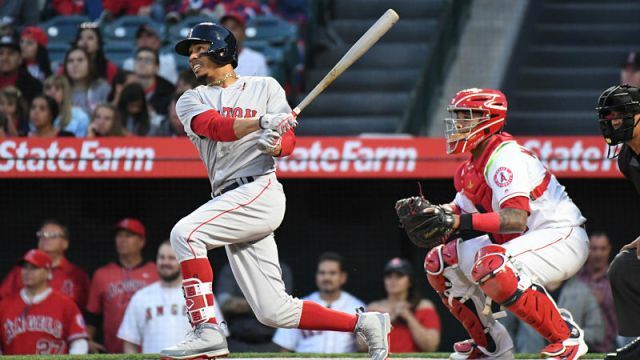 Betts' first half slash line looked more like the slash line of a player of the week or month (.359/.448/.691/1.139 [200 OPS+, 202 wRC+]). Mike Trout hasn't been far behind at .310/.454/.606/1.060 (193 OPS+, 187 wRC+, imagine Mike Trout being "behind" in anything on a baseball field - scary), and Jose Ramirez "brings up the rear" at .302/.401/.628/1.029 (169 OPS+, 174 wRC+). None of them strikeout much, which is rare these days. Trout has the highest K% at 19.4%, which is below league average. All have walked more than they have struck out, which might be an even rarer feat for them to share in the modern game. They are all on pace to break the 10.0 WAR (bWAR and fWAR) mark, which is phenomenal. Did I mention they're all 26 or younger (Betts and Ramirez are 25). Yowza! Even though it hurts to be a Blue Jays' fan right now, it sure is a great time to be a baseball fan. Of the top ten, Verlander is 35, Martinez is 30. Everybody else is below thirty as of this year, and Betts, Ramirez, Bregman, and Lindor are all 25 or younger. As Blue Jays fans, of course we should dream on the potential of Vladdy, Bo et al, but let's not forget to marvel at the players who are already in MLB, even if they don't play for the right team. I hope you enjoyed this, and I'll see you in the comments section. Cheers.